Just select the product you wish to purchase and add the quantity required to your Cart-keep adding until you have completed your order. On completion of your order you can click on your Cart to check your order is correct. Once you are happy your order is complete you can select your preferred delivery and collection option. Scottish Remote Mainland, Highlands and Islands postcodes - AB37, AB38, AB41-56, FK19-FK21, IV1-IV40, IV52-IV54, IV63, KW1-KW14, PA21-PA40, PH15-PH41, PH49-PH50, DG, TD, HS, IV41-IV51, IV55-IV56, KA27-KA28, KY15-KT17, PA20, PA41-PA78, PH42-PH44, ZE Northern Ireland, Eire, Isle of Man, Shetland Islands, Channel Islands, Isle of Wight. Saturday deliveries carry a £20.00 Courier surcharge. Once you have selected your Delivery option please click on your Cart and then select the Delivery option you have chosen in the Cart page. You can then click on the Checkout page. If you have already registered or placed an order with us before, you can enter your e-mail address and password (given to you on your previous visit) and go on to the next page. 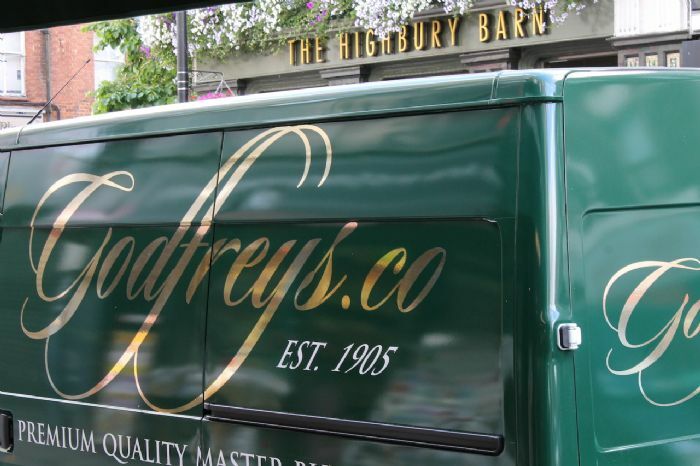 If this is the first time you have placed an order with Godfreys and you are new to the site, just enter your E-mail address and you will be asked for your postcode. The delivery Courier charge will be shown if applicable and you will be asked for your Delivery address and contact telephone number.The next part under your Delivery address is Delivery Instructions. When you place your order, it is essential that you specify instructions for the Courier should you happen to be out when your goods are delivered. This could be an alternative delivery address such as a neighbour or a safe place to leave your box such as a patio or garage. We can also arrange delivery to your workplace or a friend if that is more convenient. Once you have agreed to our Terms and Conditions, you will automatically transferred to a secure server where you will be requested to input your Credit/Debit card details for them to be authorised. You will then be informed that your order has been accepted and the sent an E-mail as confirmation. We are also happy to accept orders in advance of these dates should you wish. Please note that delivery dates may be affected by public and Bank Holidays If you have any concerns how these may affect your delivery times, please do not hesitate to give us a call on 0207 561 1713 between 4am and 2pm and we will answer any queries you may have. As our products are supplied fresh and prepared to order, we regret that once an order has been placed it is not possible to cancel that order, and refunds cannot be given. In the unlikely event of a product being unsatisfactory please contact us on 020 7561 1713 immediately. Please do not return the goods without contacting us. Q. How is my order dealt with? A. Once you have placed your order on our web site you will receive a confirmation e-mail. We will then prepare and despatch your order either that day if it is placed before 11 am or the next day. Your order will be delivered the following day. Any orders received between noon on Thursday and noon on Monday will be despatched on Mondays. We do not deliver Sunday or Monday. Q. How is my order prepared? A. Your order will be freshly prepared, vacuum packed and placed in specially insulated cartons for Nationwide Delivery. These contain state-of-the-art ice gel packs, which keep your order chilled for up to two days. A. All deliveries are made by APC/ CYC Couriers or our own refrigerated vans - and all packages must be signed for, so it becomes your responsibility to ensure that someone is at the address to accept delivery. Q. When I receive my order how long will it keep? A. Each order is contained in a frozen gel cooling pack which ensures the products remain at the correct temperature for at least 48 hours. We send out all our products atmospherically sealed, a natural way to keep the meat fresher for longer, with a best before date on it. It follows that meat products should be placed in the fridge prior to eating. Q. Is my order suitable for freezing? Q. What if I am not home for delivery? A. There is an option to provide specific delivery instructions, for example a safe place to leave the goods (possibly a neighbour) should nobody be there to accept delivery. If such information is provided the Courier will be informed accordingly. Q. Can I choose a specific delivery time? A. Unfortunately no, our Couriers delivery times are from 8.00 am to 6.00 pm. If you are not at home, the Courier will leave parcel according to the instructions given with your order. A. No, you can place an order up to any value. Q. Can I place an order for you to send as a gift to a relative or friend? A. Yes. When ordering, you can enter the different shipping address on the checkout page when requested. You can also leave your own special message, which we will pass on when making the delivery. Q. Do you send items abroad? A. Payments can be made by credit or debit cards, using our secure online ordering facility. Q. How do I know that my card details are safe to put on the Internet? A. A unique benefit of paying with our system is that merchants including ourselves receive payments without ever seeing your financial details. Q. What do I do if I have any problems?